Quote from the Resource homepage: "Out of Daze was made for SCEneST'97. As the name suggests, this trackmo contains those parts, which weren't put into Daze, for various reasons. As a tradition in the history of Resource demos, the linking was finished at the partyplace. This time we spent almost an entire day linking the demo. We sat there for more than 10 hours, trying to eliminate all the nasty bugs... At the last minute, the IRQ loader refused to work. It was during the 4K intro compo. During the 4K and 64K intro compo, we had to change the loader. Since we didn't have any other loader with us, we had to rip it from our magazine, Widobet, relocate it manually, and insert it into the demo... After it was done, we did a quick test to see wether it worked or not, and rushed to the compo room to hand in the demo. 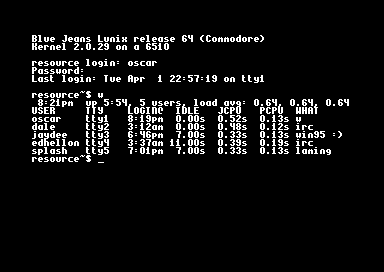 We even managed to see the last 2 or 3 64K intros, before the C-64 democompo started :) Although we were terrified that the loader may crash, it worked flawlessly... In the end, we got the 1st place shared with Breeze's Lone Star." Kristian and Eivind/SHAPE appeared as guest artists.